Angler fish that is found in seas looks wonder and fearful. It has crisscross teeth, wonder body color, peculiar shape and along with this a tentacle on the head. Compared to other fishes, these fishes have some special qualities. So, whenever a new species are found, scientists conduct researches on them. Even now also two new species of angler fishes are seen in the seashore of Greenland. Whenever we are going in darkness, we will take a torch with us. In the same way, these fishes also have a natural torch light that is present at the end of tentacle. Whenever required it glows like a bulb and no other fish has this special quality and this has made the angular fish so special. With the help of this torch it hunts the food and escapes from enemies. The light is possible because of bacteria and it is self lightening. These will come into the body through the small holes in the tentacle. These will reach the end of the tentacle and lightens in blue and green color. The bacteria would benefit by getting safety it gets the food. 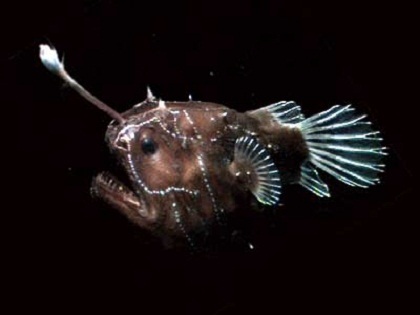 One more species of angler fish was seen with sharp teeth. This is called as longhead dreamer and as the name suggest the head is bigger than the body. The mouth is so big that it can swallow the fish that are two times bigger than its body. Approximately, it grows to a length of 17 cm. It is estimated that these are present in sea for more than 13 crores of years. Some of the fish types in this can change the body color according to surroundings. Till now, only one tentacle and with a bulb at the end is found till now. Now an angler fish, which has two bulbs, has been seen. The name of this is double baited angler fish. It stays in a depth of 4,568 feet from the sea level. It has tentacle on head and another below face. It swallows small fishes with this if they come across.